This past weekend the Maryland SoccerPlex (Montgomery County) played host to some of the best collegiate soccer in the county – ACC Men’s Soccer Championship. The final four teams made their way to Montgomery County for the semi-finals Friday night under the lights. The two matches played to overtime with the University of North Carolina taking the early match and the University of Maryland taking the night cap. 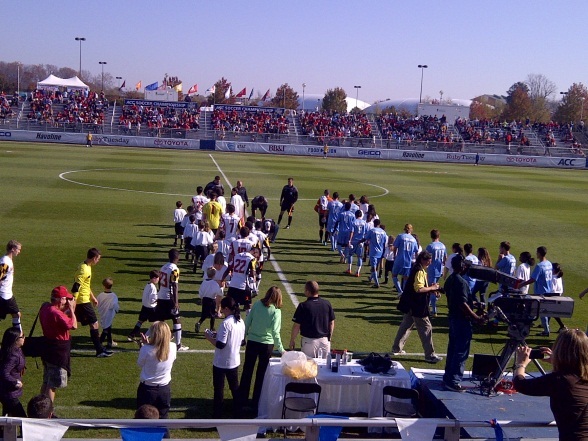 I had the good fortune to travel over the SoccerPlex on Sunday afternoon for the championship match between the Tar Heels and Terrapins. The Terrapins won the match 2-1 (complete match recap) in front of a capacity crowd of over 9,000. The atmosphere was definitely that deserving of a championship match. The stands were packed and the end zone was filled with a very energetic and robust Maryland student section. And as someone who was charged with ensuring unspectacular the weather, I delivered a beautiful and sunny mid 60 degree day…in November! I want to take a moment to congratulate the University of Maryland on their ACC Men’s Soccer Championship crown. More importantly, I would like to thank and congratulate the Maryland SoccerPlex for their commitment to delivering a first-class event at their first-class facility. The pitch looked outstanding, the venue was well dressed and the staffing was great. SoccerPlex Executive Director, Trish Heffelfinger’s team did an outstanding job of working with the ACC, the participating universities and provided a great fan experience. They definitely showcased the State of Maryland at its best. I tip my hat to our friends at the Maryland SoccerPlex. Next stop the 2012 NCAA Men’s College Cup! Maryland opens the College Cup as the #2 seed and will take on the winner of the Brown v. Drexel on November 18th at home. The University of Maryland Baltimore County (UMBC) Retrievers also qualified for the NCAA Men’s College Cup. Retrievers will open their quest for the College Cup on the road at Old Dominion University in Norfolk, VA on November 15th. Maryland will have to win four matches and UMBC will have to win five matches to have a chance to compete for the College Cup on December 9, 2012. Good luck to both the Retrievers and Terps!